Debugging feature in Android phones are meant for developers. 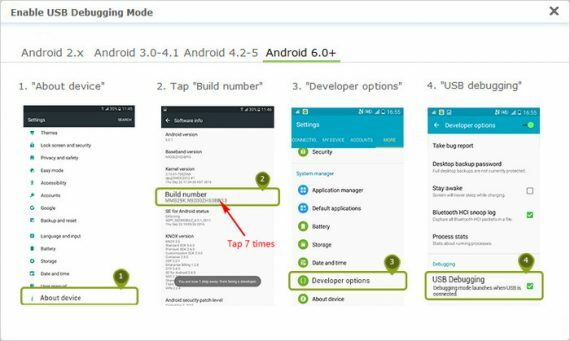 As a developer, you can enable debugging mode on your Android phone to have control over some hidden feature in the device. Android KitKat, Jellybean and other lover versions of Android OS have their debugging tool where you can easily access it. This is a different case when it comes to Android 6.0 (Marshmallow) and Android Nougat (Android N). A non-developer can also use debugging feature in Android when connected to the PC. They are different options available when you connect your Android phone to your PC using USB, debugging is one of them. Meanwhile, if you have not used the debugging feature in your phone before, it will remain hidden and you have to enable it so you will be able to view it through the phone developer’s option. Android Lollipop, Android 6.0, and Android N offer the same approach to unlock developer mode so as to give access to access the debugging page. Therefore, here is how to enable debugging on Android 5.1, Android 6.0, and Android 7.0. Swipe down the phone screen and click on the “Settings” gear icon > Scroll down to About Phone > Tap Build number multiple times until getting a note You are under developer mode (You must tap the build number for at least 7 times before this popup will come up > Back to Settings > Click Developer options >toggle to enable USB debugging. Always disable debugging mode on your device when not in use. This is for your phone security reason. Meanwhile, after you have successfully enabled debugging mode on your Android phone and the feature is not in use, the developer option will hide again. This means that when next you want to use the debugging option when your phone is connected to your PC via USB you need to follow the same procedure to enable it again.